Salt as a new commodity. 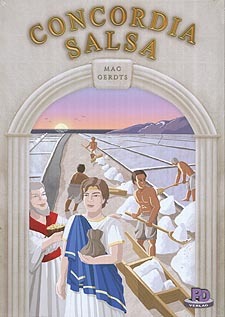 It is produced in salt cities and may replace any other commodity as a wildcard resource. 27 unique forum cards that introduce more variety and new strategies. 1 new double-sided game board showing Byzantium and Hispania as new historic scenarios. Concordia Salsa is fully compatible with the original game board Imperium/Italia as well as the first expansion board Britannia/Germania.